Knorr® Selects™ sides are made without any artificial flavors or preservatives, and are gluten free! Our flavorful Roasted Garlic Alfredo expertly blends rice with garlic, parmesan, Romano and aged cheddar cheeses into a satisfying rice dish. Roasted Garlic Alfredo is rated 4.2 out of 5 by 624. Rated 5 out of 5 by cmdiem2 from Garlic Alfrado Rice Knorr Selects Roasted Garlic Alfredo Rice was amazing. It was easy to cook like other bagged rices, but this had more flavor and went well with a few meals. I made the whole bag and broke it up into little servings. By itself the Knorr Roasted Garlic Alfredo Rice was great. It paired well with chicken, fish, and steak. I tried with burger, but that was the least good combination. It was still good, but I probably wouldn't do it again. The only real down side is the price. It's not crazy high like some other brands, but I'd personally wait until it's on sale and buy several at once. I look forward to trying more flavors of Knorr like 4-cheese rice. Rated 4 out of 5 by Allib221 from Great for families! As a mom of four young kids, I am always looking for an easy side dish or meal for dinner. We are often on the go to different activities and I don't have time to make intricate meals. 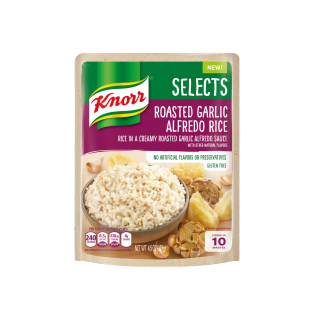 Knorr Select Roasted Garlic Alfredo Rice is perfect for our house. It was quick and easy to make. The directions are clear and super quick. The flavor of the rice is delicious. Alfredo is a favorite in our house so this rice was a hit! I served it with roasted chicken. I ended up dipping the chicken right into the rice! I would recommend this product to anyone. The next time I purchase this I am going to use the recipe provided on the package so we can have it as the main dish. Rated 3 out of 5 by melinda_tn_16425588 from Inspired a new meal idea I received a coupon for Knorr Selects (Buy one get one free) from PinchMe.com. I chose to redeem this coupon to try the Roasted Garlic Alfredo flavor. I did not have set plan for using this product. Recently I found myself home on a rainy evening and without a dinner plan. I took the Knorr Selects Roasted Garlic Alfredo rice, left over roasted chicken, green peas, diced carrots and made a warm, comforting dinner in only a few minutes. It was a hit! Thank you Knorr, for this type of quick preparation product and thank you PinchMe.com for affording me the chance to try this product free of charge. I will gladly purchase this product in the future. Rated 4 out of 5 by LizzyZane from Pretty Good Side Dish My family loves alfredo so we decided to try the Knorr Selects Roasted Garlic Alfredo Rice. We weren't sure what to expect since it seems to be hit or miss with prepackaged rice mixes. This was surprisingly tasty though. It had just a bit of garlic flavor and a really good alfredo taste to it. The thing that threw us off the most was actually just having an alfredo sauce on rice since it's usually on pasta, but that's more a personal preference thing. If you're considering trying this as a side dish for your family, and you're fans of alfredo sauce, I'd definitely recommend giving this a try!